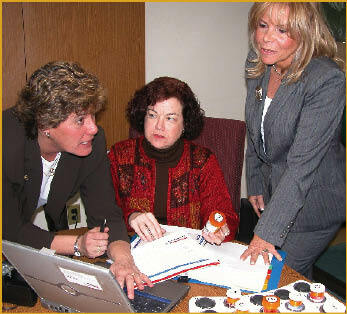 From left, Ellen Nash, vice president and co-founder, Siobhan Regan, nursing supervisor and Carol Greenberg, president and co-founder of Concept: CARE in the White Plains office. This is the fourth in a series of features on the five winners of the 2006 Fifth Annual Westchester County Business Hall of Fame sponsored by The Business Council of Westchester. Induction into the hall is a lifetime achievement award for a business or an individual who has made a significant contribution to their company and the Westchester business community. Carol Greenberg grew up with her grandparents. They lived in the same house with her parents and uncle in New Haven, Conn., and offered her a close view of the issues associated with aging. "My grandmother was the matriarch of the family, and she became ill and was moved to a nursing facility. I saw her deterioration over time after she was diagnosed with Alzheimer's." The experience awakened a passion in her to provide the elderly population with the high-quality care she herself would one day hope to receive. "I saw what life in a nursing home is all about and I did not want ever to have to place my parents in a facility like that. It opened my eyes to a commitment, a direction to develop something that would set a precedent." The commitment led her to form Concept: CARE in 1995. The agency's efforts over the next 10 years have led The Business Council of Westchester to distinguish her with the 2005 Hall of Fame award for Women in Business Success. "We provide comprehensive care. There are so many options out there if you have a loved one who needs care. There is home care, institutional placement, assisted living, social day care and we work through them with you," Greenberg says. A client-care coordinator assesses a client's needs, including any third-party funding that may be available and develops a plan for care with the family. In the first three years, the agency grew from 30 to 125 health-care providers and has enjoyed steady revenues of more than $2 million for the past four years. After graduating from the University of Connecticut in Storrs in the '70s, Greenberg wanted to combine her passion of caring for seniors with her passion for music on Long Island. She went to work as a "recreationist"(music therapist in today's terms) in a Long Island nursing home. Subsequently, she worked for Kimberly Quality Care, a nationwide health-care provider with local offices on Long Island. As she rose through the corporate ranks, she felt the growing distance between herself and patients. "I wanted to put the human back into human services and bring it back to the community." Greenberg also wanted to keep health care immediate and responsive. "Health care is spontaneous. Health care is immediacy. We're dealing with clients during a crisis. With big corporations, the decision you needed today wasn't made until next week." To provide the needed clinical background, she partnered with Ellen Nash, who had a background in high-tech nursing. Greenberg wrote the business plan for her vision in the White Plains public library. "Then I hit the road and tried to sell it." She determined that she needed a $150,000 of initial investment to get the concept off the ground. When looking for an investor, she was looking for more than someone with a deep pocket. "I wanted a person to invest in a belief or a vision, I wanted someone who was committed." The initial investment was provided by four investors. One of them was a lawyer, who offered legal representation in exchange for a piece of the business. Ken Stern of The Stern Agency in Pomona in Rockland County was one of the four investors. "She proposed ownership for a price as an investor and we decided to take on a nice chunk of it. We felt very confident with her connections in the industry and her deep commitment to the health-care profession. We saw a return on our investment after two years and the business was doing conceivably better than her projections," Stern said. From the beginning, Greenberg designed Concept: CARE's physical location to reflect the positive feelings she wanted her employees to feel when they walked through the doors. "I was willing to bite the bullet to have a small professional office in a nice location. I wanted our caregivers to have a good feeling walking in through our doors." In 1995, the year the agency received its licensing from the New York state Department of Health, the agency set up in a small space on the 10th floor of 30 Main St., adding rooms as needed. Five years ago, she moved to the 9th floor -- almost 3,000 square feet with seven full-time and three part-time caregivers and where every office has a window. She has just signed the second five-year lease on the space. "Sometimes, health care is depressing and you need to have light come in," she said. Caregivers who work for Concept: CARE have a homehealth-aid certificate for the state and a requirement specific to the company is that they have at least six months of experience. "I meet caregivers four or five times before they are sent into the field. I want them to tell me why they're in this field, I look for a track record of compassion." Greenberg says out of 10 people who meet the qualifications on paper and who are invited to an interview, only two get hired. At Concept: CARE, the average age for caregivers is 40. With the rising aging population and increased life span, health care for the elderly will only continue, if not escalate in importance and Greenberg wants to keep the public focused on these issues. "Thirty-five percent of our work force has elder-care responsibilities and there are $37 billion dollars of lost revenue because people have to take time off from work to take care of elderly relatives," Greenberg said. In the early '80s, Greenberg worked for Barbara Bernard who then owned Affiliated Home Care. Six years ago, Greenberg asked the retired Bernard to join Concept: CARE as a community relations advocate. "I thought we needed someone in the industry who would go out and educate our communities on what the aging issues are and the options of choice for our challenged population."